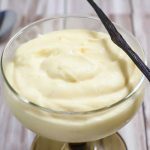 Keto Pudding Recipe - Vanilla "Smooth & Creamy" - EASY 4 ingredient! Treat yourself to our smooth and delicious Creamy Keto Pudding Recipe using real Vanilla Bean. It’s sugar-free, gluten-free, grain-free and just plain delicious! Place the heavy cream into a saucepan over low heat. Split the vanilla bean and scrape out the seeds, add the bean and seeds to the cream and allow to infuse for 5 minutes. In a mixing bowl, add the egg yolk and erythritol and whisk until the mixture is pale. Check the temperature of the cream, if the cream is cool enough for you to put your finger in it then it is ready to use. If not allow to sit for a little longer to cool. Pour ¼ of the cream mixture into the egg yolk and whisk to combine, add another ¼ of the cream and finally all of the cream. This method is called tempering and allows the eggs to slowly warm up without cooking. Pour the eggs and cream back into the saucepan and back over low heat. Using a silicon spatula continually stir the mixture until it begins to thicken. The mixture is thick enough when it coats the spatula without dripping off. Pour the pudding, through a strainer, into a clean mixing bowl and continue to stir as it cools for 5 minutes. To cool quicker, place the bowl of pudding into larger bowl filled with ice cubes. Place a sheet of cling film over the pudding and press it onto the surface to prevent a skin from forming. Place the pudding in the fridge for 1-2 hours to cool completely before enjoying.